I have been interested in just intonation as a way of tuning the harp since 2009 I think. Recently I was chatting about this and I was asked, is there a simple instructions or directions about how to tune the harp just? It is not possible to have every interval on an instrument like a harp perfectly in tune. As soon as you make some intervals perfect, others become sour or dull. There are various solutions to this, and I wrote in 2009 describing some of the possible tunings for early Gaelic harp. Equal temperament is the modern scientific solution, making every interval a little bit equally out of tune. Historical systems that are usually used include Pythagorean tuning, which makes all the 5ths and 4ths pure but leaving the 3rds very rough, or Meantone which makes all of the major 3rds pure, leaving the minor 3rds and the 4ths and the 5ths sour. Just tunings on the other hand make different intervals of the same “class” different sizes, so some 4ths, 5ths, minor 3rds and major 3rds are pure, whilst others are out. Just tunings are the most obvious solution for a diatonic instrument, because you can maximise the amount of consonance without having to take account of all the sharps and flats and key changes that you find in a chromatic instrument. I have made up three instruction / demonstration sheets which show three possible just tunings that you can try on the harp. The first is pretty much the way I have been doing things, deliberately since 2009 and “accidentally” for somewhat longer I think. This one is pretty easy to tune on the harp, as the 5ths are all pure except the 3rd one in the sequence from a up to e, and if you listen to the sympathetic hum of the harp it is not hard to sound this 5th and tune it narrow so the e sounds pure against the sympathetic g drone of na comhluighe. The third one is based on Highland bagpipe scales presented by Seamus MacNeill and also by Barnaby Brown. It is tuned exactly the same as the one above except that when you start the cycle of 4ths you push the c wide to make it sound wild and scary, just like on the pipes. The middle one is a kind of half-way house I have made up. I think it’s harder to tune because your narrow 5th is the second in the sequence, d up to a. The a is not speaking so clearly against the sympathetic drone of the harp, so even though this tuning has more consonances than the other two I don’t think I will end up using it. But it’s in there as an option to think about. You’ll notice that it is a transposed version of the first: scale 2 with f natural is the same as scale 1 with f#. The circles showing the consonant intervals are also useful if you want to think about the properties of different modes. You might think that the pentatonic scales c-d-e-g-a and g-a-b-d-e and f-g-a-c-d would all sound the same, but a glance at the chart will show that this is not the case at all! 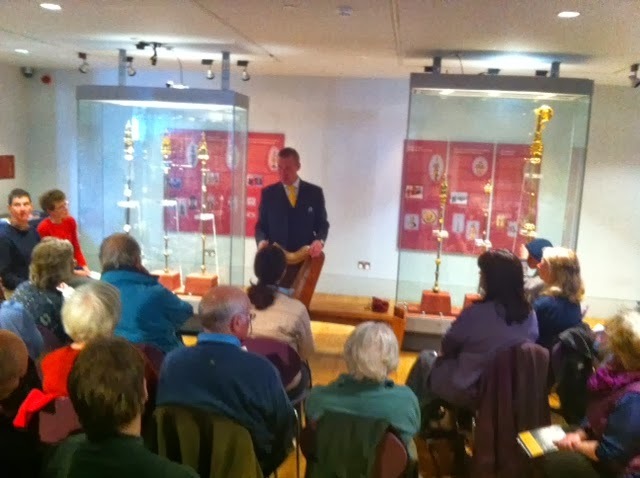 Here’s a photo taken by one of the Museum staff, of my concert the other week. The turnout was bigger than I had expected, at least 50 people in what is a fairly small gallery space. 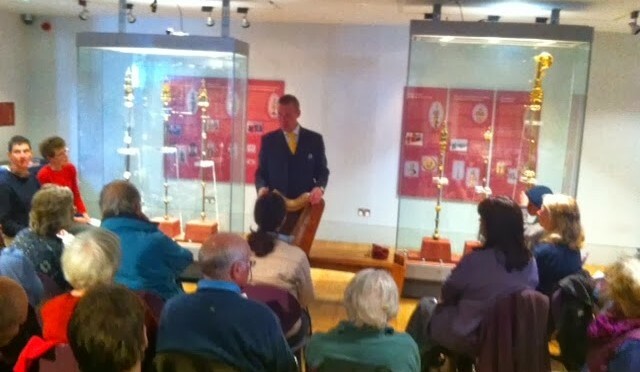 As usual I was slightly nervous of presenting the big, complex, intricate ceòl mór style pieces to a general audience, but afterwards people came up to me and said that the piece they loved best was Caniad San Silin – about 13 minutes of repetitive geometric variations. For me it was such a thrill to present the music in this glorious setting. I chose pieces that were closely connected in to late Medieval contexts, all of them secular instrumental tunes. The structure and style of the music really fitted well with the decoration and craftsmanship of the medieval maces. You can see some of the maces behind me. From left to right, Glasgow, Heidelberg x 2, Tübingen, Erfurt, and Bishop Fox’s crozier from Corpus, Oxford. Dammit they are just so shiney! Tobar an Dualchais/Kist o Riches is today announcing a special fundraising campaign to support our ongoing work to develop online access to some of Scotland’s most important audio archives. Tobar an Dualchais/Kist o Riches is a landmark project to digitize, catalogue and make available online thousands of hours of folklore and folklife recordings made in Scotland over the past century. 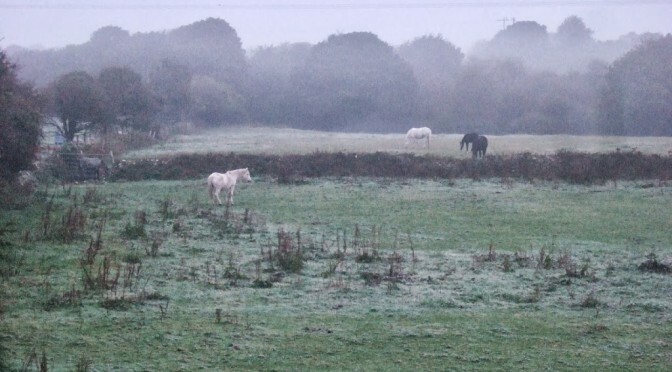 Most of these recordings come from the Sound Archive of the School of Scottish Studies at the University of Edinburgh, which contains a wealth of traditional songs, music, tales, poetry, oral history and information on a range of traditional customs and beliefs, from weather lore to second sight, and much more. Already an invaluable cultural and linguistic resource, Tobar an Dualchais/Kist o Riches contains a great deal of material in Scots, English, and Gaelic, including many hundreds of recordings made in the Hebrides by John Lorne Campbell of Canna (1906–1996), starting in the 1930s. Our archives are also an important documentary source of information on the enormous social and economic changes that occurred in 20th century Scotland, with ordinary people across the country describing the last days of centuries-old working practices and the corresponding effects on their communities. Although our website now contains many thousands of such tracks, several thousand more hours of recordings from the School of Scottish Studies Archives and Canna Collection are still waiting to be catalogued and added to the site. To help us achieve this goal we are inviting members of the public to donate to our new crowdfunding campaign, hosted by Sponsume at http://www.sponsume.com/project/tobar-dualchais , and running until the 15 December 2013. Donors can choose from a range of fantastic rewards, including limited song releases from our recent Gaelic and Scots Artists in Residence, traditional musicians Julie Fowlis and Chris Wright, short-courses at the Sabhal Mòr Ostaig college on Skye, and Lifetime Membership of the Traditional Music and Song Association of Scotland. For more information on Tobar an Dualchais/Kist o Riches and our new fundraising campaign, please contact Mairead MacDonald (Director) on 01471 888 600 / md2.smo@uhi.ac.uk, or Chris Wright (Crowdfunding Campaign Manager) on chris.wright@ed.ac.uk. This week I was visiting harpmaker Natalie Surina in Oughterard. 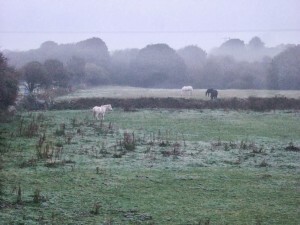 My photo shows the early morning mist rising between the hedgerows. 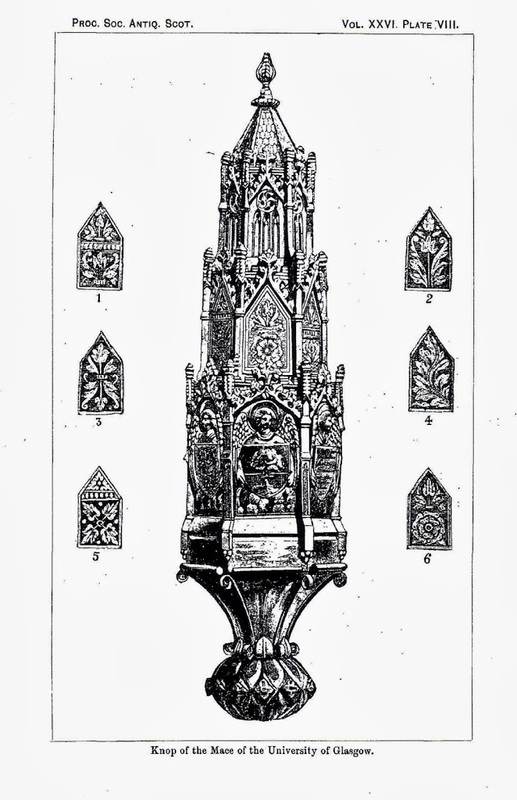 This drawing is from Alexander Brook’s 1892 article in PSAS, on the maces of the Scottish Universities. 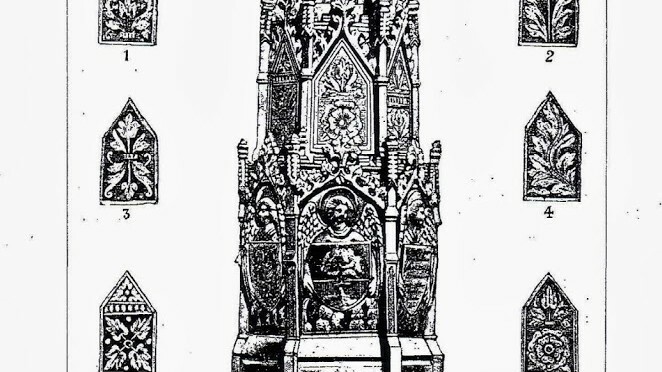 It is a drawing of two of the six heraldic shields on St Andrews Arts faculty mace. The one on the right, no. 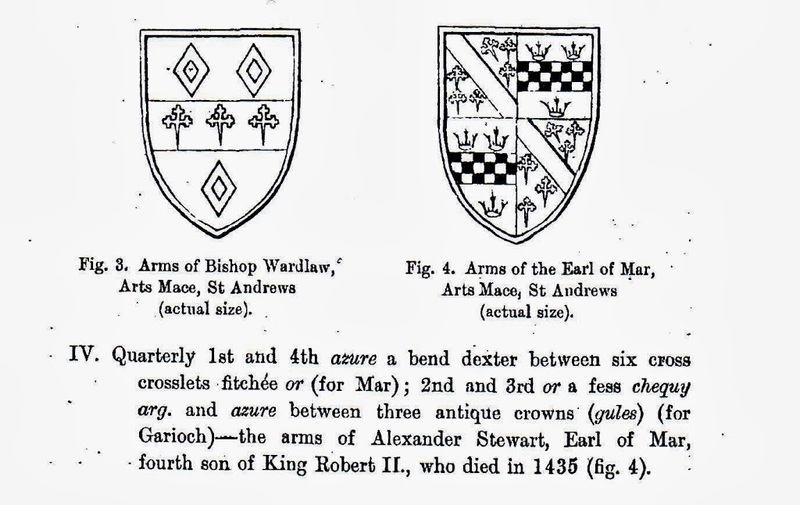 IV, shows the arms of Alexander Stewart, Earl of Mar (c.1375-1435). 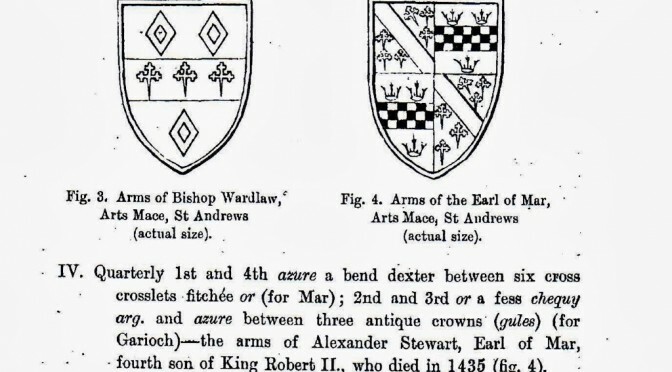 I don’t know what his connection is with the University of St Andrews, though he witnessed a royal confirmation of the University’s charter in 1432. The University started in 1411; the shield was presumably made and affixed to the mace on its completion in about 1416. 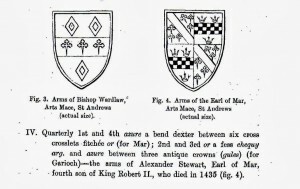 The Earl of Mar led the Royalist army at the Battle of Harlaw in 1411. It is fascinating to me to trace these connections. I will point out this coincidence in my concert on Sunday, when I will play the ceòl mór variation set of Cath Gairbheach (the Battle of Harlaw). Unfortunately the side of the Arts Faculty mace that has Mar’s shield is facing away from the centre of the exhibition room, but you can see it OK if you go round the other side of the case. I always enjoy ringing treble or tenor as I find it a challenge to strike as well as I can manage and to use good striking to help keep the rythym and flow of the others going well. I also purchased the download of the Quarter peal rung at St Cuthbert’s, Prospect, New Zealand. 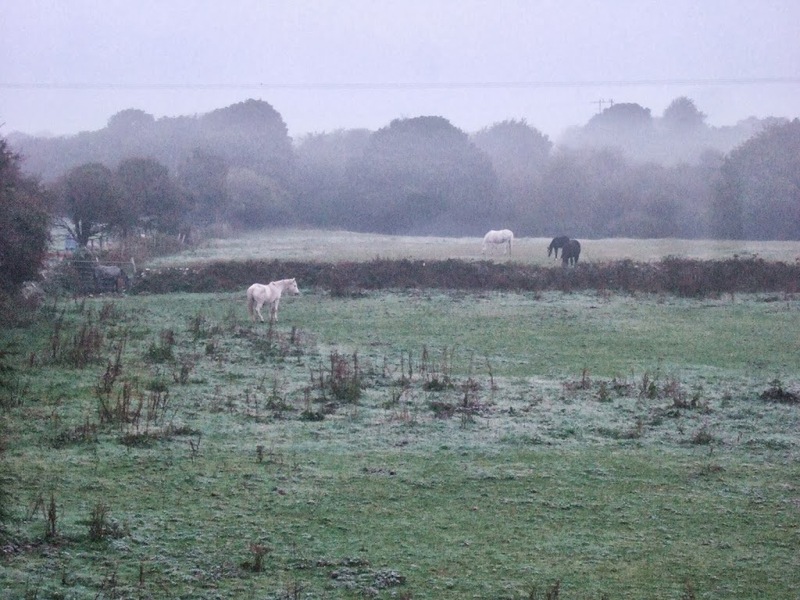 It is quite something to listen to this whole thing, and it gave me yet another thing to think about, the sound and music, how different it is from an outside listener to an inside participant. The rythym of the recorded performance is much harder to follow than the rythym you hear when ringing – the act of participating gives a real visceral interaction with the rythyms of the sound, and everything seems to move more slowly and clearly. 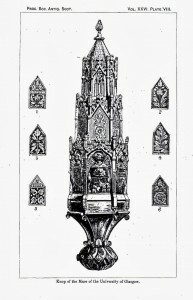 I suppose there is something similar going on with all kinds of musical performance but the logic of the bells seems to highlight this more than the freeform melodies and harmonies of other instruments.